A film by a young Argentine director is among the upcoming offerings by the Union Theater in — surprise! – the student union on the campus of UWM. 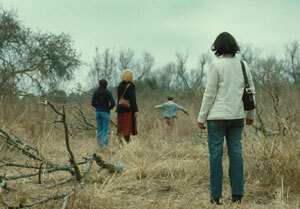 The film, “The Headless Woman” or “La mujer sin cabeza” is by Lucrecia Martel of Argentina. It will be shown Nov. 20-22 at 7 p.m. It is in Spanish with English subtitles and lasts 87 minutes. The Headless Woman is an elliptical, subtle and unnerving third feature film from Lucrecia Martel (director of La ciénaga and The Holy Girl). Vero (Maria Onetto), an affluent dentist, is driving alone on a dirt road, becomes distracted and runs over something. In the days following this jarring incident, she is dazed and emotionally disconnected from the people and events in her life. She becomes obsessed with the possibility that she may have killed someone. The police confirm that there were no accidents reported in the area and everything returns to normal until a gruesome discovery is made. Scene from "The Headless Woman"